Using examples from his own life, Martin shows how he uses mindfulness to cope with daily stress. He also advises readers on how they too can incorporate simple mindfulness exercises into their lives to help them de-stress and be more able to deal with distressing situations as they arise. Martin Stepek has written a book of great beauty, clarity and generosity. As a manual for mindful living, each page has something for us all. Extremely insightful and helpful book. Mindfulness had changed the way i deal with situations that crop up and can impact on mental health. Highly recommended . 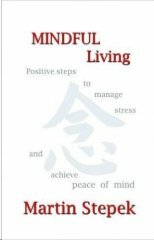 you are in the hands of an expert here... shows you how to apply mindful living in day-to-day activities. It will brighten your day. Fantastic book! I've used it with my clients as well as myself. Martin can explain how to apply mindfulness to our lives so easily, no jargon and easy to understand. Martin shines a bright light in Scotland and his books are so inspiring. Thank you so much for bringing so much peace to my life in troubled times and making me notice the birds and the simple beautiful things around me. This is a wonderful book. I keep it at my bedside and dip into it if I wake feeling anxious, down or negative. It never fails to lift my mood. Excellent, enlightening book. It has changed the way I live my day to day life. It could change yours too! Eastern methods for the Western world. With increasing rates of depression and anxiety everyone should know about the practice of Mindfulness. I've been following his articles in The Sunday Herald...excellent! Excellent book. It has really helped me on days when I feel low.it has also helped me learn how to be more mindful of what's around me. Martin Stepek is an inspiration to me. Buy his books. Go to his lectures. Change your life. Another outstanding book by Martin Stepek. Any book by this author is essential reading. A beautifully written book showing a deep understanding and reflection a life lived in the practice of mindfulness.